It was truly a great honor to be recognized by American Painting Contractor with a 2017 TOP JOB Award. 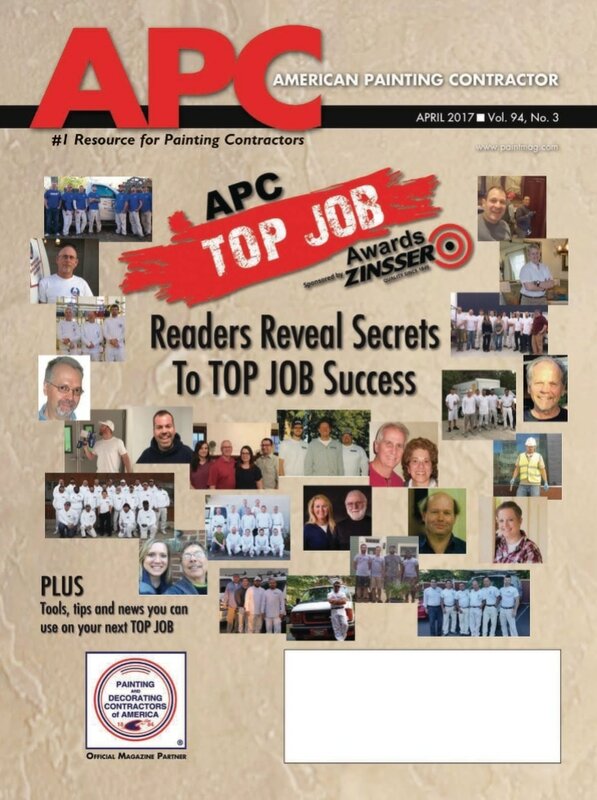 Since 1999, APC magazine has held the national contest to recognize excellence in the painting and decorating industry. Sponsored by industry leaders like Zinsser®, Sherwin-Williams®, Graco® and Faux Effects®, the TOP JOB Award is an annual showcase of America's finest painters, from a one-man show or small crew of two to the large outfit that employs dozens, perhaps hundreds, of highly skilled decorators. Though we previously never took the time to submit an entry, each year we looked forward to the TOP JOB issue. The craftsmanship displayed on each page was always inspiring, and the tips and tricks shared by winners often helped us rethink our approach to various tasks. Consider it: a whole issue full of impressive projects and award-winning professionals essentially giving a how-to. If you don't walk away from something like that with a few new ideas, you're simply not willing to learn. In late 2016, we finally decided to submit an entry for a job we affectionately referred to as The Midcentury Makeover. A 1960s ranch located on the famous Mount Desert Island, the home was in dire need of an overhaul. Being the only painting concern in the state of Maine to specialize in Midcentury Style and Design, it was a perfect project for us. To share in our celebration, we received several congratulatory letters. Congratulations on receiving the coveted TOP JOB Award from American Painting Contractor magazine. This well-deserved award, given for excellence in painting and decorating, is a testament to the superior service and quality craftsmanship you provide at Gatcomb Painting & Design. In three short years, you have built your business from a one-man contracting operation to one of the fastest growing businesses in Hancock County, forging a reputation for excellence and commitment to a job well done along the way. Thanks to your work-ethic and unparalleled customer service, Gatcomb Painting & Design continues to thrive. You should be proud of all you have accomplished. Again, congratulations on this achievement, and best wishes for your continued success. It's a pleasure to join your family, friends, and colleagues in offering my congratulations on being selected as the 2017 recipient of the TOP JOB Award from American Painting Contractor. Local businesses like yours are one of the building blocks of Maine's economy. I applaud the accomplishments of your win of this National Award and wish you many more years of success! Congratulations on your recent award! I'm so happy for you! I remember when we first met you were a one-man operation with a part time helper. I also remember passing one of your jobsites just last summer and there were half a dozen painters at work and it seemed like your signs were in every yard. If it were anybody else, I wouldn't believe it was possible for a company to grow so fast, but your expertise and work ethic were evident the first time we met. You deserve every ounce of success you have achieved! Congratulations on receiving the Top Job Award! I am absolutely thrilled for you! How very exciting for you and your company. Your knowledge, workmanship, and integrity are superior. A well deserved honor. Just saw you in the paper. Nice job. It was neat seeing the article but not surprising. When it was just you and one other painter staining our house many years ago, we knew you were going places, so it's kind of "cool" to have been in on the "ground floor."